With a small knife, cut out a 1” diameter circle from the top of the dessert cake. Insert 2 Snyder’s of Hanover® Pretzel sticks into the dessert cake to act as axles. Push 1 of the halved marshmallows onto each exposed tip of the Pretzel Stick “axles”. Insert a Peep into the cutout area of the dessert cake. Note: you may have to trim the Peep to fit. 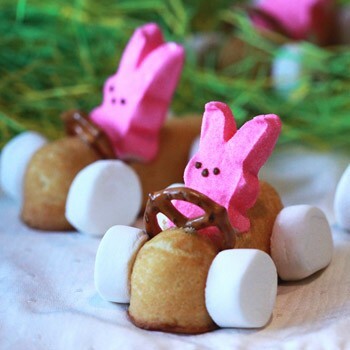 For the steering wheel, insert a Mini in the dessert cake against the belly area of the Peep.